A little pre-ramble: Thanks for all the nice comments on the anniversary post. After I published it, WordPress informed me that it was my 100th post — a pretty cool achievement (and coincidence), I’d say. And today, January 4th, is the anniversary of starting my blog — its first birthday! So here we go — on to post #101 and another year of living and blogging in Switzerland. 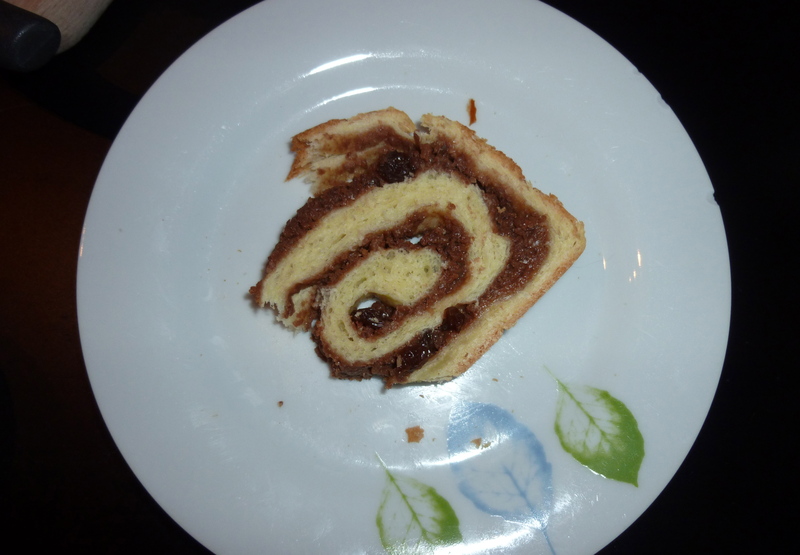 Cozonac is a Romanian bread traditionally eaten at Christmas and Easter. It is sweet and rum-flavoured, with a swirl of either a walnut-based or Turkish delight-based filling decorating each slice. It is the perfect bread that needs nothing on top; it is delicious with milk, and highly addictive. Stelian has been eating it every Christmas of his life; I’ve been eating it every Christmas since meeting him and his family. So when we didn’t return to Canada for Christmas this year, we mourned its absence. That’s when I decided, hey, I’m an intrepid hausfrau — I should take matters (in this case, wads of dough) into my own hands. 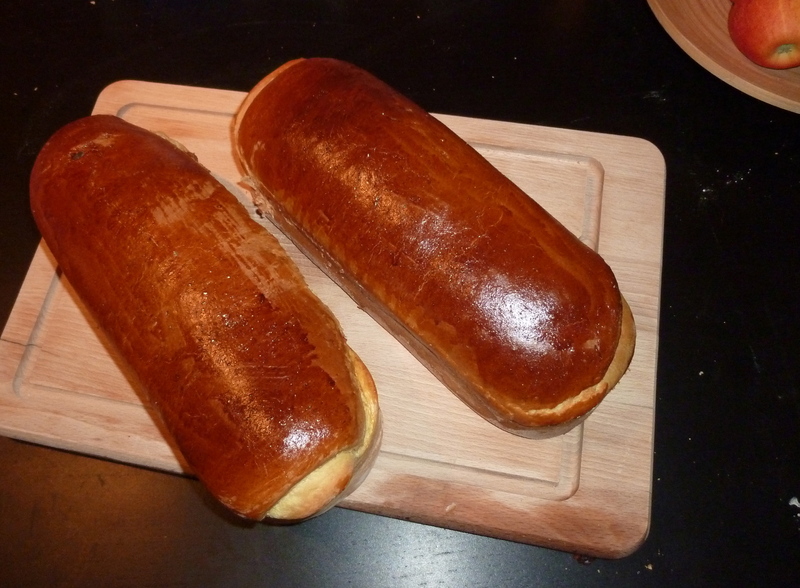 Stelian’s mom is the cozonac master — hers loaves always look perfect and taste glorious, so naturally, it was to her that I should have gone for the recipe. The only problem with that is that like many highly skilled bakers, she does not need a recipe, and works with the dough pretty intuitively, sensing when it needs more or less of something. I, on the other hand, am scared as heck of breadmaking, and I can sense the needs of dough about as well as I could those of a baby crocodile. I needed step-by-step, no-deviation-allowed instructions. Luckily, through the magic of the internet, I was able to find a recipe in English and bossy enough to be suitable for a beginner. And the result? After several hours spent mixing, kneading, rising, rolling, and filling, we had this! 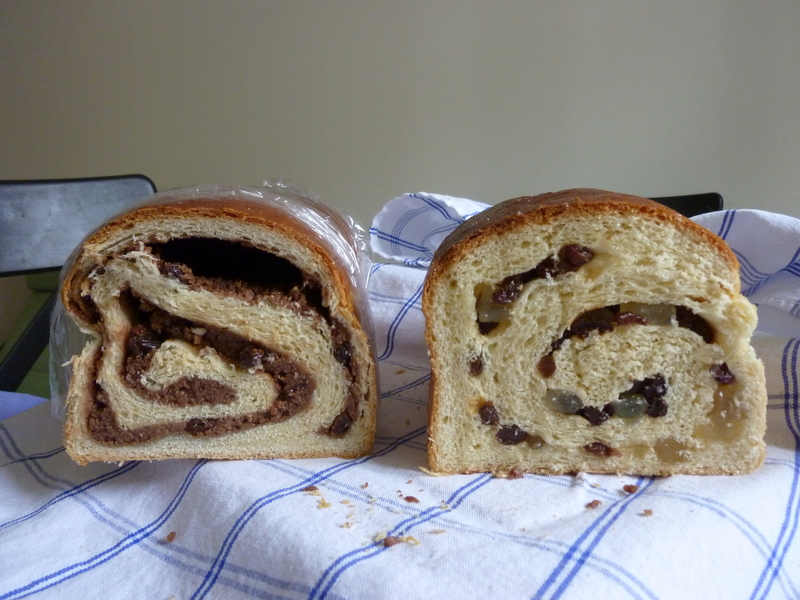 The one on the left is the walnut-raisin filling; the right has Turkish delight and raisins. They were both so, so good — the air bubble in the lefthand loaf did not affect its deliciousness, and I was assured by Stelian’s mom that this just sometimes happens. So, not bad for a first attempt, and the proof of success is in the fact that the 2 of us ate nearly 2 full loaves of this in 3 short days. So there you have it…another way in which we are becoming fat, and another reason for you to come and visit. Now, if you’ll excuse me, I’m going to go run on the treadmill forever. Oh my! What a treat and congratulations on your first attempt at bread-making. The Internet does good things for a ‘non-bread-maker’ (you), since both loaves look simply scrumptious. No wonder you devoured them in short order. Tell Stelian he now has another reason he married you :). Anyone who can make bread like that is a keeper!! Congrats on reaching the century mark! We love reading your blogs, and it seems hard to believe that a whole year has gone by. As to the cozonac, it looks divine! I can’t say if I’ve ever had Turkish delight, or if I have I’ve forgotten it. I thought it was only the brand name (like “Mars Bar”) of a candy. What does Turkish delight taste like? And do you or Stelian know the derivation of the word cozonac? I’m not sure about the word origin question, but I can tell you about the Turkish Delight. It consists of two glorious ingredients: sugar and corn starch. It’s soft and sticky, and it can be dyed different colours, but when “plain” (which is what we bought to add to the bread) it’s that clear-yellowish colour. The Big Turk bar (sold in Canada, and also much beloved by me) has red-coloured Turkish delight covered in chocolate, so I grew up thinking that all Turkish delight had those two things (bright red colour, and milk chocolate) before learning otherwise. My mouth is watering just looking at your photos. Congrats on the cozonac! No way — we’re into healthy New Year habits now! I hear you on the healthy New Year habits. We’ve been trying to plan our meals and grocery list a few days in advance because that tends to lead to healthier meals. But yesterday I discovered that we just happened to have all the ingredients to make peanut butter cookies…and we made a huge batch. Now I’m trying to convince myself that peanut butter cookies are actually a healthy choice!